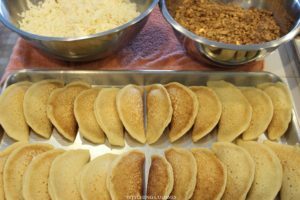 Middle Eastern stuffed pancakes are the perfect Ramadan dessert for nuts and cheese lovers! Ramadan Mubarak to all my Muslim sisters and brothers worldwide! As this blessed month comes to an end, I pray that your Ramadan has been full of barakah and blessings. 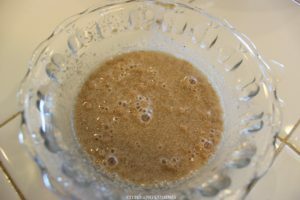 Ramadan is my favorite time of the year and I wanted to share a delicious dessert commonly eaten and loved throughout the Levantine countries during this blessed month. 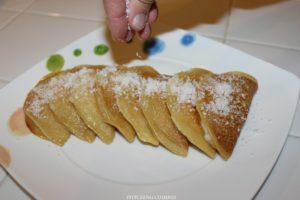 When I was younger and lived in Kuwait, my father would bring home a different kind of dessert each night of Ramadan, from Knafeh to Halaweet Smeed. 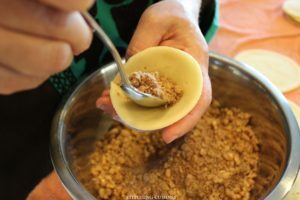 While she made Mamoul at home, my mother never tried to make the Katayef batter at home because it was easy to find in stores. She would fill and bake them at home. 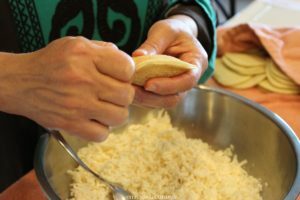 When she moved to the United States, she had to learn how to make her perfect batter, which wasn’t available in stores, so that we could experience the Ramadan tradition here. 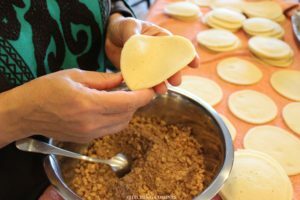 My family loves Katayef, so I learned how to make them from my beloved mother. I am so glad that I make them every year and share them with friends. 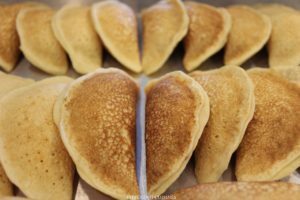 Katayef, whether filled with cheese or nuts, is loved by all. 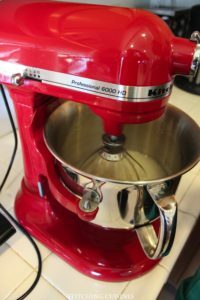 The process is definitely worth the delicious outcome! I’ve provided step-by-step instructions with pictures in hopes that it will better explain the detailed process. 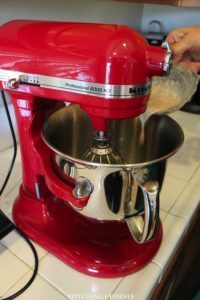 Add warm water and wet ingredients and then turn on the mixer. 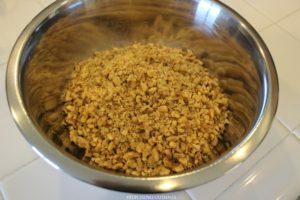 Begin to add the dry ingredients slowly as everything mixes together. 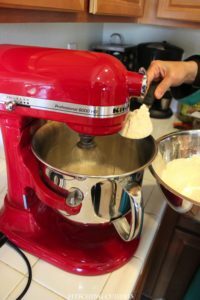 Raise mixer level and mix the batter until it reaches a thick consistency. 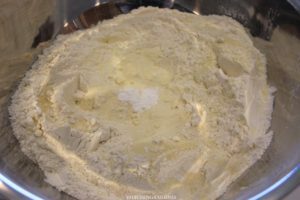 Cover the batter for 30 minutes. 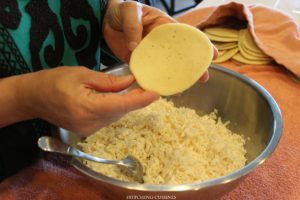 Let’s begin preparing the filling! Our walnut lovers! Our cheese lovers! 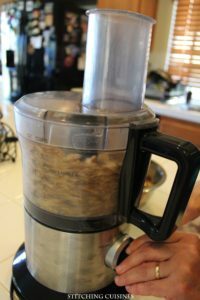 Crush the walnuts in a food processor for a few seconds, keeping the pieces large. 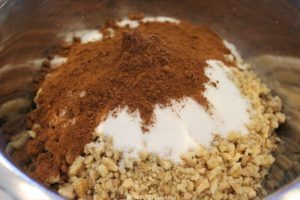 Add the sugar and cinnamon and mix thoroughly. 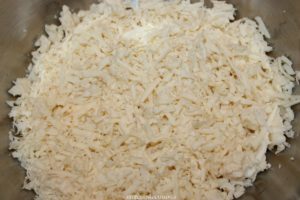 The cheese is simpler to make. 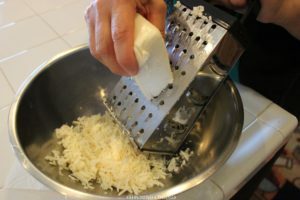 Shred the cheese and you’re set to go! The fillings are now ready! 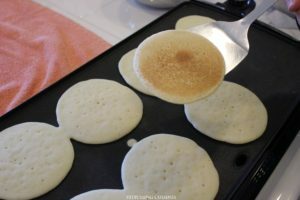 Use a ladle or item with a spout to pour small pancake-like circles onto the griddle. Do not turn over the Katayef! Unlike pancakes, you only cook one side. Wait until small bubbles begin to form across the entire Katayef. 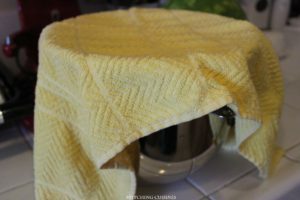 Remove and place onto dry towel, without forming layers, and cover with towel so they don’t dry out. Time to fill the Katayef! Place each Katayef on palm of hand. Pinch together the edges of one half of the Katayef. 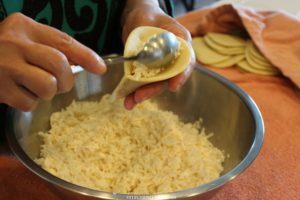 Place 1 tsp of filling [push the filling in if it’s cheese]. Don’t overfill them. 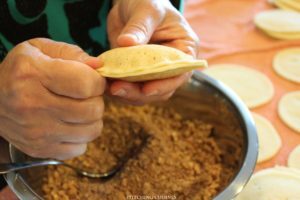 Make sure no filling touches the edges or it will be difficult to close. 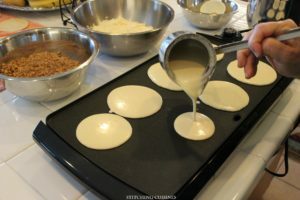 Overfilling will cause them to open while baking. Pinch together the rest of the Katayef making sure it is completely closed. Don’t they look beautifully delicious! 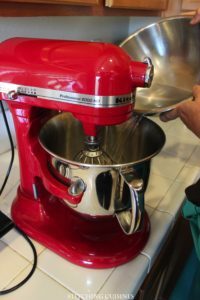 Extra filling can be saved in the refrigerator for next batch or other desserts. 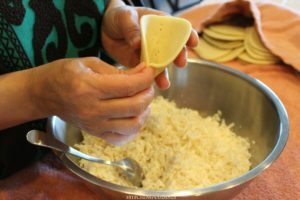 Extra uncooked Katayef can be kept in the freezer: place flat on tray, freeze overnight, store in tightly sealed bags until you want to eat them. To eat, thaw for 30 minutes and then bake as instructed below. 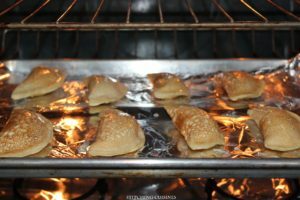 Time to bake the Katayef! In the Middle East, you will see that they fry the Katayef in deep oil. I prefer to bake them like my mother taught me. Preheat oven to 375º F. Place Katayef flat on a pan. Brush both sides of Katayef with melted butter. 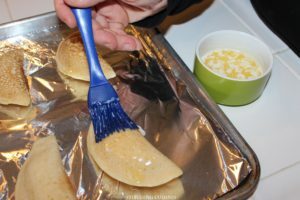 Place the pan in the oven and bake for 20 minutes. 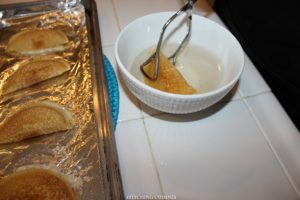 Take out of oven and dip in a bowl containing the sweet syrup or drizzle it. 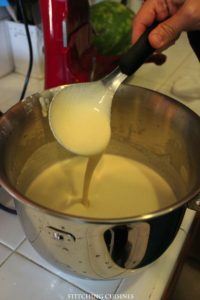 [Syrup recipe is below and can be found in Knafeh recipe.] 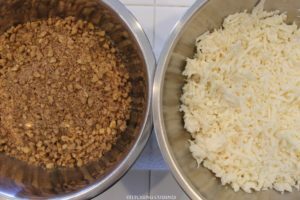 Garnish with coconut or pistachios. 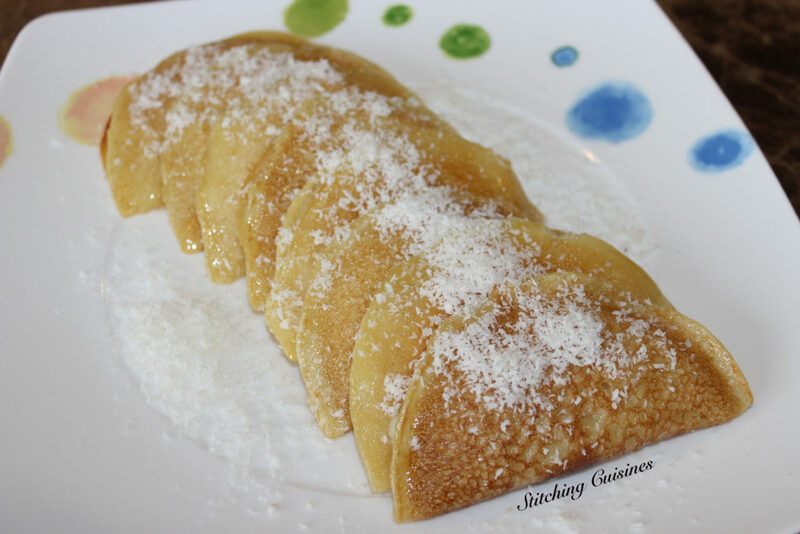 Your sweet Middle Eastern pancakes are ready! Do not turn over the Katayef! Unlike pancakes, you only cook one side. The syrup should be transparent. *In the Middle East, you will see that they fry the Katayef in deep oil. I prefer to bake them like my mother taught me. 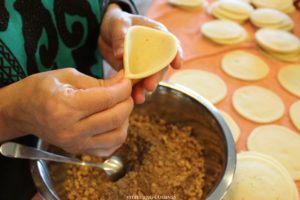 Extra uncooked Katayef can be kept in the freezer: place flat on tray, freeze overnight, store in tightly sealed bags until you want to eat them. To eat, thaw for 30 minutes and then bake as instructed above. 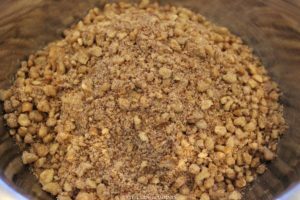 Have you ever heard of a confection that consists of a layer of spiced walnuts between two layers of semolina porridge or dough, which is then baked and cut into squares? I have a friend who is of Syrian ancestry, and his mother used to send him a tin full of baklava and this other confection which he called Smeed. In my Internet searches I have learned that that word refers to semolina. I have not found a recipe for the confection I have described. Do you know about anything that is similar? Hi Hilary! I believe you are describing Halawet Smeed. 🙂 This is one of my favorite desserts, I make it a little differently. Here is my recipe: http://stitchingcuisines.com/halawet-smeed-vegan-semolina-cake. 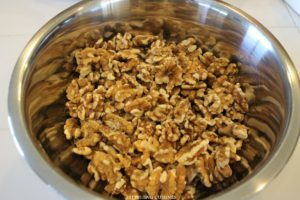 With this dessert, you can choose to add walnuts and even cheese (to be added when it’s still hot). 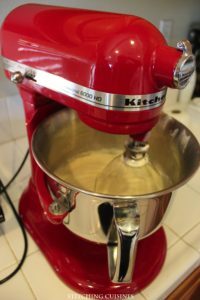 I hope you try this recipe and enjoy it! Sorry, I wrote a wrong email. It’s Teresa. 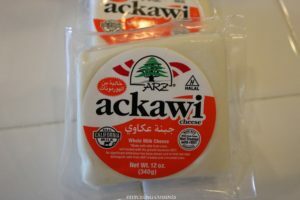 Where do I can find Ackawi cheese. May I replace it with any other cheese? 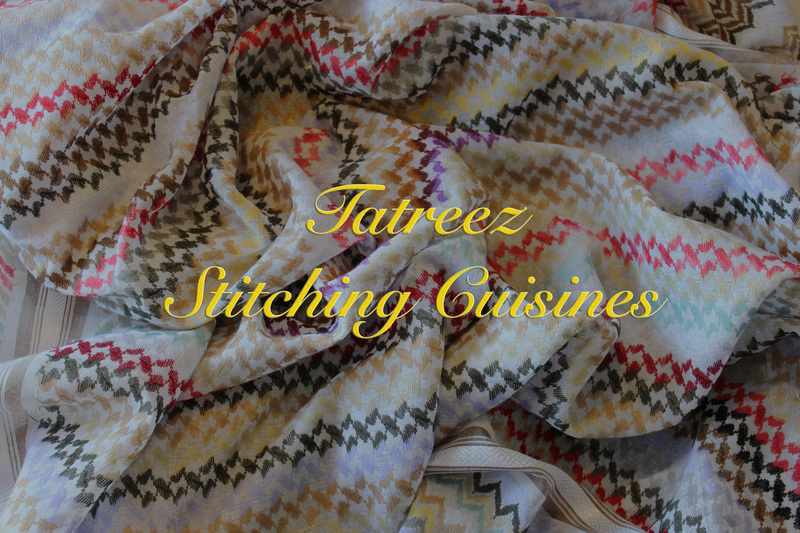 © Copyright Tatreez: Stitching Cuisines, 2015. All Rights Reserved.